Summer time might not be as convenient but on the other hand, you are more likely to find better deals on hotels and accomodations. What to pack for summer? Pack very light, cotton, breathable clothing, sandals, hat, etc. and also a light sweater for the air-conditioning which will be running full blast at shopping centres, restaurants and the hotel lobby. Umbrella is essential, rain jacket not so. It gets so hot, wearing a rain jacket is very uncomfortable. And remember, amusement parks are fun rain or shine, you are even expected to get wet at some rides. 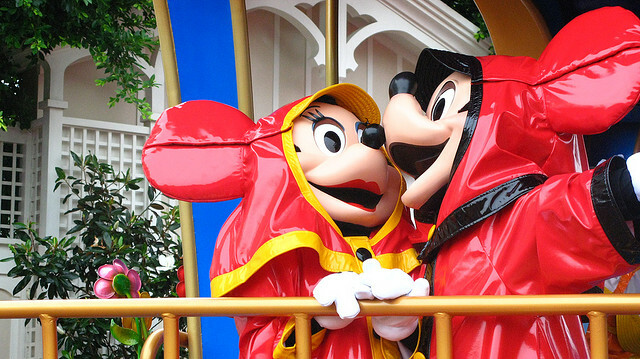 On the other hand, if it is raining too hard, some of the rides might be closed, so something to be aware of. The wettest hottest months are June through August. Although not optimal, all is not lost, there is still much fun to be had and here are some fabulous events just to get you and the kids started! 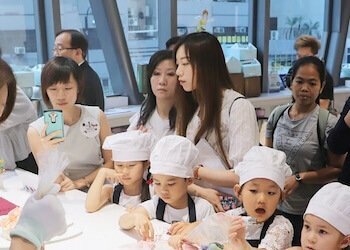 Check out other fun things to do in Hong Kong with Kids, whether you come in the summer or any other time of the year! 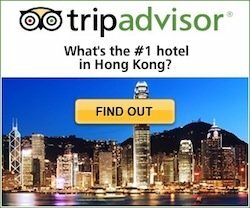 And don't miss our top picks for Hong Kong Hotels with Kids, some family-friendly options with larger rooms, swimming pools, and pedestrian areas nearby with plenty of restaurants, cafes, shops, etc. 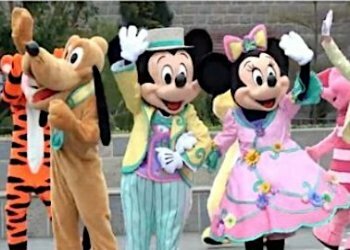 Mickey, Minnie and the gang will be sporting their new spring-themed outfits and putting together The Stars Springtime Celebration, this is a lively show on Main Street with all our favourite Disney friends old and new! This spring, the newest highly-anticipated Marvel attraction is making its debut, Ant-Man and The Wasp: Nano Battle Launch is set to start battling March 31, 2019. How Much? Disney Springtime Celebration activities are free with Park Admission. Recognized over the world, Cirque du Soleil has constantly sought to evoke imagination, invoke senses and provoke emotions. 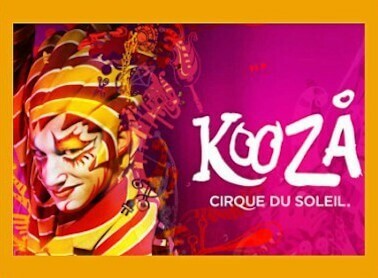 A return to our origins, KOOZA combines acrobatic performance and the art of clowning, while exploring fear, identity, recognition and power. Check out the Dragon Boat Races! 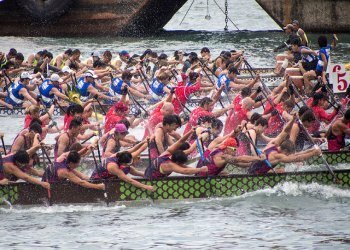 Dragon Boat Racing is serious business in Hong Kong. Chances of catching a race or a training session at the very least, is excellent in the summer months. These are very lively and exciting events with hundreds of teams competing against each other in this great tradition. The Dragon Boat Festival on June 18, 2018. Races are held by the several Dragon Boat Associations throughout the territory. All events are free to the public. For further details check out our main Dragon Boat Festival page. And it is not just about the racing, the Dragon Boat Carnival is one huge massive party in the waterfront with one of the world's most gorgeous skylines as backdrop together with clowns, entertainers, marching bands, lion dances! Here's more on this year's Dragon Boat Carnival. There will be two different animal-themed grand parades during both the day and night, a DJ party and vocal band performances at Aqua City Lagoon, and of course plenty of splashing fun at Whiskers Wet & Foam Bash and at the water playground at Whiskers Harbour. 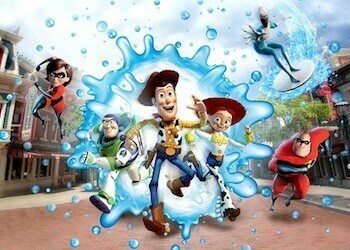 Water Play Street Summer Party a Pixar Extravaganza! How Much? Disney Street Summer Party activities are free with Park Admission. If you have a passion for baking, cake decorating, or just love cakes, breads and other delicious temptations, then you'll love the Hong Kong Bakery Carnival. A series of events for the family are planned including parent-child bakery activities, playful competitions, baking workshops, stage programs, Masters' demonstrations... Whether it's pinnaple buns, milk tarts, from simple classic treats to elaborate piggy mooncakes... Bakery Carnival will have you whipping up some exciting and delicious summer fun! More Info and tickets: https://www.hkbakerycarnival.com/. 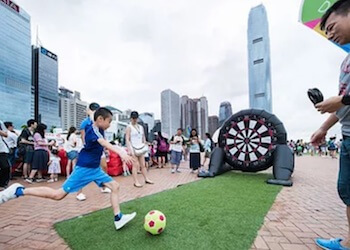 This is a FREE fun summer programme that transforms the Central Harbourfront into a major playground with a variety of garden games and activities, a fantastic illuminated art installation, and over 20 free organised events for families and kids to enjoy throughout the summer. Events range from a Balance Bike Carnival, Golden Classics Charity Show, Holistic Wellness, Hip Hop Dance Competitions and more. 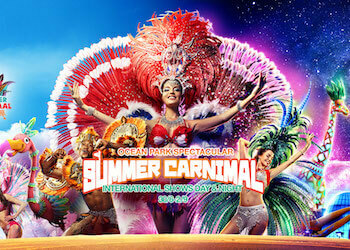 More Info and events calendar: www.summerfest-centralharbourfront.hk/. Carnival rides come to AIA Vitality Park this summer! This summer, additional family entertainment attractions have been launched and are great to combine with a ride on the Observation Wheel for fantastic views of the skyline and harbour. 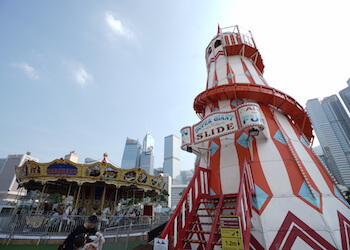 A specially-made traditional merry-go-round and a Super Giant Lighthouse Slide are at the harbourfront ready to entertain the young and the young-at-heart! 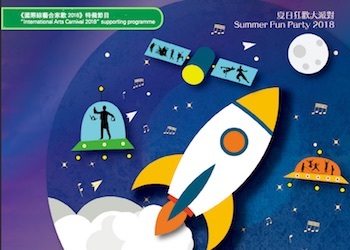 Organised by the Hong Kong Leisure and Cultural Services Department, this weekend annual event includes a variety of activities organised for families to enable them to participate in recreation, music, cultural, sports programmes featuring a range of themes in a fun and delightful atmosphere. Activities in the past have included magic shows, lawn concerts, painting exhibitions, dance workshops, face painting, handicraft playshops, roving artists, etc. and is a supporting programme of the International Arts Carnival which runs through the summer months, see below. How Much? : General admission Adults HK25, children HK10, early morning admission (before noon) HK10 tickets available at fair only every day. 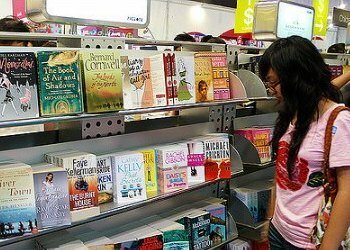 More Info: Hong Kong Book Fair official site. 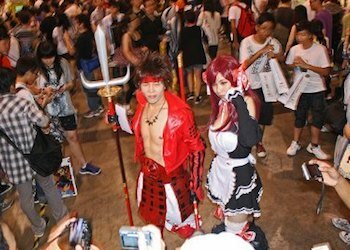 This fair is open to the public and packed with the latest in big wave trend-setting entertainment, this is one of the most prominent shows in Asia, and the target audience is between the ages of 12 and 30 years-old. Don't miss the many events including stage forums and presentations, model kit competitions, comic Master's autograph sessions, etc. and new this year, a concurrent exhibition, ACG Outlet, a mega outlet for all kinds of anime licensed products selling at big discounts will be located at Hall 3. App developing and marketing companies will be showcasing the latest in games and entertainment. Featuring comics and figure design competitions, an international COSPLAY carnival, ACG live performances and a variety of stage events. And at the X-Zone Young @ Mart, over 100 mini-stalls are set up at this mini-flea market zone full of bargains and latest innovations, some reserved for Doujinshi artists. "Me, you and the old guitar. How perfectly, perfectly happy we are. MEEE-EW and the old guitar. How PURRRR-fectly happy we are!" This is a family programme in English. 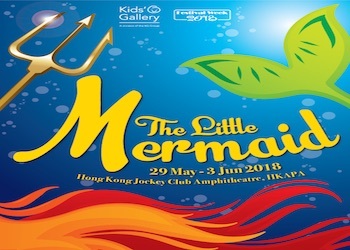 Join the Kids' Gallery students in their annual spectacular, as we journey under the sea in The Little Mermaid. 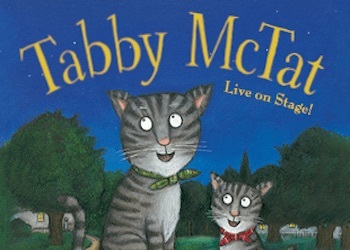 Showcasing an array of talented performers aged 2 to 16, enjoy this family-friendly show full of singing, dancing and fun for all. This is a family programme in English. 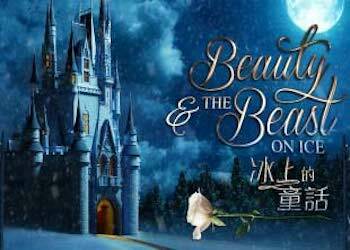 Combining an original musical score, stunning choreography, beautiful sets, costumes and special effects, with some of the world's finest ice skaters and aerial acrobats, the Russian Ice Stars bring this enchanted story to life with their dazzling interpretation. The Amazing Bubbleman has been thrilling audiences around the world for over 30 years with the magic, art, science and fun of bubbles. 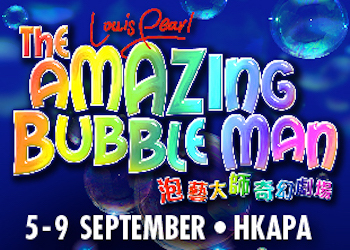 From square bubbles, fog-filled bubbles, trampoline bubbles to flying UFO bubbles and even people inside bubbles - prepare to be enthralled as Louis Pearl, the Amazing Bubbleman, returns to Hong Kong for the third time, following his last sell-out visit in 2015. Playing to sold out houses all over the world, the Olivier Award nominated POTTED POTTER - The Unauthorized Harry Experience - A Parody by Dan and Jeff takes on the ultimate challenge of condensing all seven Harry Potter books (and a real life game of Quidditch) into seventy hilarious minutes. Even if you don't know the difference between a horcrux and a Hufflepuff, POTTED POTTER will make you roar with laughter. 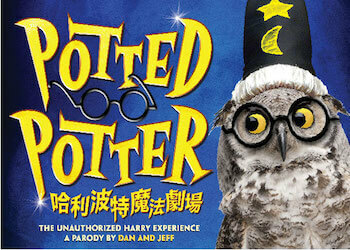 Potted Potter is perfect for ages six to Dumbledore (who is very old indeed).